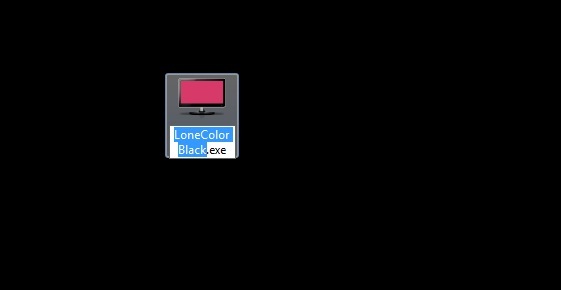 We had seen plenty of tools that can change the background color of your desktop or set some live wallpapers. But all those tools comes with an interface, options and features that you might not even use/required. How about a tool that is portable, no installation required and doesn’t feature any complex interface, but works like a gem? Wouldn’t be cool? Well, we are going to speaking about one such tool called “LoneColor”, that allows you to change the background to any solid color with a matter of a click. As I told earlier, LoneColor doesn’t feature any interface and doesn’t require to be installed. You will only have to download it from the link provided at the bottom of this page and start running it. Ok one thing that you might need to do is, run the app with administrator privilege via ‘Run as administrator’, if UAC is enabled. OK! You might ask me why would someone wants to set solid colors as background when there are beautiful wallpapers? Well, probably a good question but that depends upon a need. Sometimes you might want to capture a screenshot and focus only the window or an application that you need. Wouldn’t be good to take a snapshot with a solid color as background instead of a distracting wallpaper in the background? Download LoneColor and let us know your comments.